A powder coat finish is a durable, corrosion-resistant finish which can be applied to steel, aluminum, brass, copper or iron—virtually any type of metal. The process begins with stripping the item to bare metal. This is done to remove old paints, rust, finishes, dirt and grease. Once prepared, the item is then sprayed with a dry powder that resembles baby powder or flour. The powder is sprayed through a gun that electrically charges it. It’s this electrical charge that causes it to stick to or “coat” the metal. The item is then baked in an oven at 400 degrees for 32 minutes (just like baking cookies). During the baking process, the powder gels and flows into the nooks and crannies to give it the most durable and brilliant finish available. 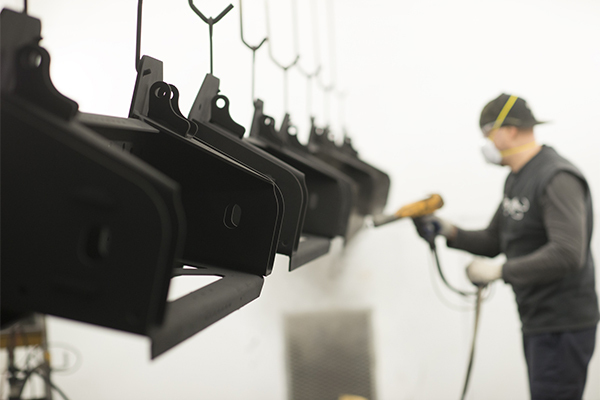 Ingham’s Powder Coating can provide a superior powder coat finish that is resistant to rust, cracks, chips, peeling and fading. Powder coating is available in several hundred colors and textures, and can even be done in glitters, candies and veins. To avoid additional charges, we request that items are disassembled and ready to be refinished, including the removal of all bearings, bushings, rubber, plastic, wiring, etc.